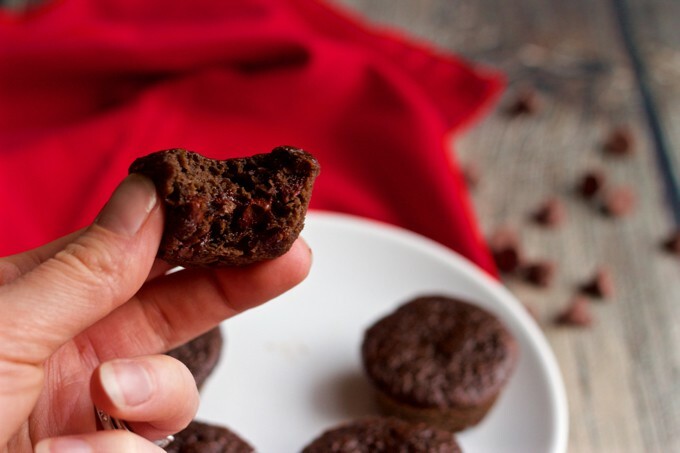 Easy, one-bowl healthy chocolate mini cupcakes are 100% whole wheat, low in sugar and have no butter or oil – and they are super fudgy and delicious! Happy Monday! Well, only semi happy here, to be perfectly honest. My team lost the Super Bowl yesterday. Lost big. Lost bad. And we were so pumped! The whole family, M and J, all of us, were so into it. Dabbing. Chants. Cheers. Excitement! Sigh. That was yesterday, and this is today. So now, I’m all about Valentine’s Day! If you follow me on Instagram, you might have seen that I don’t buy candy for my kids. Ever. They get it at preschool, from family on occasion and I do buy a little as Santa Claus or the Easter Bunny, but that’s it. However, that doesn’t mean they are deprived. Far from it. 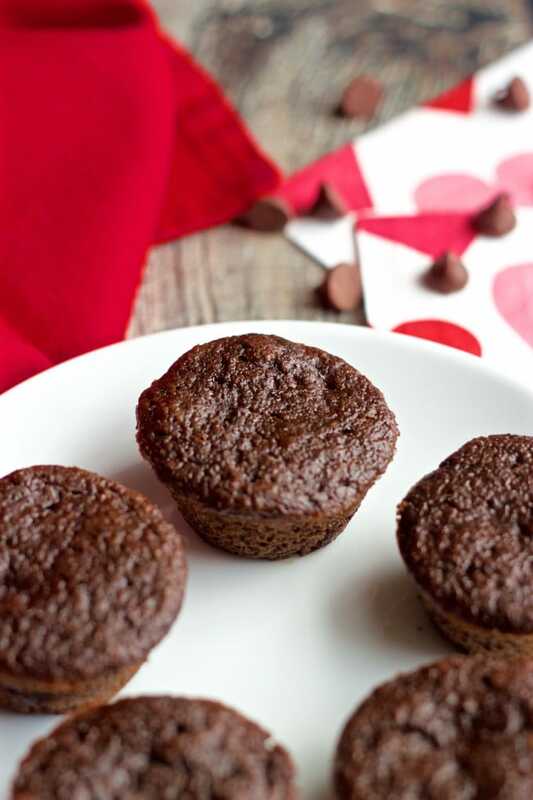 These double chocolate mini cupcakes have been a big hit at our house this Valentine’s Day. I also made some regular size cupcakes out of these and M was a very happy girl. Does it get better than cupcakes? And these unbelievably soft, light, chocolate-loaded cupcakes, well, these make mama happy too. They’re 100% whole wheat, low in sugar and don’t have any butter or oil. Plus, they are so sweet that you don’t even need icing. 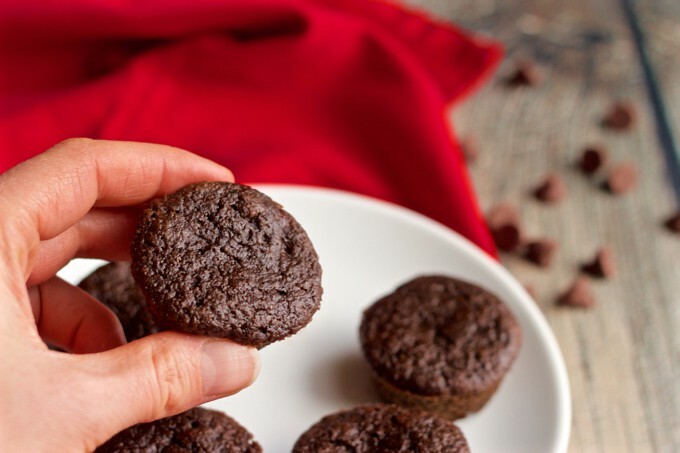 All around, it’s a much healthier version of cupcakes. And you better believe I popped a couple myself! 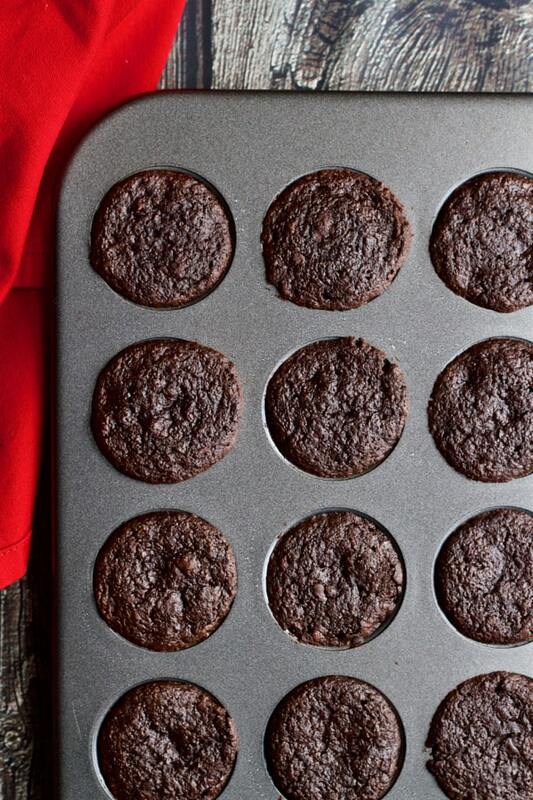 Oh, and in case you need some, I use mini muffin pans like this all the time – especially for the kids’ muffins. They freeze well, too, if you want to get the extras out of sight so you don’t eat.them.all. As I said, you can make these as healthy chocolate mini cupcakes or you can make full chocolate cupcakes. I prefer the small ones. It works better for my little ones to have a smaller sweet snack and I prefer having a couple little ones instead of a whole cupcake. Plus then I can have one every day. Or maybe multiple times a day… who’s counting?! Just look at that! So very fudgy! 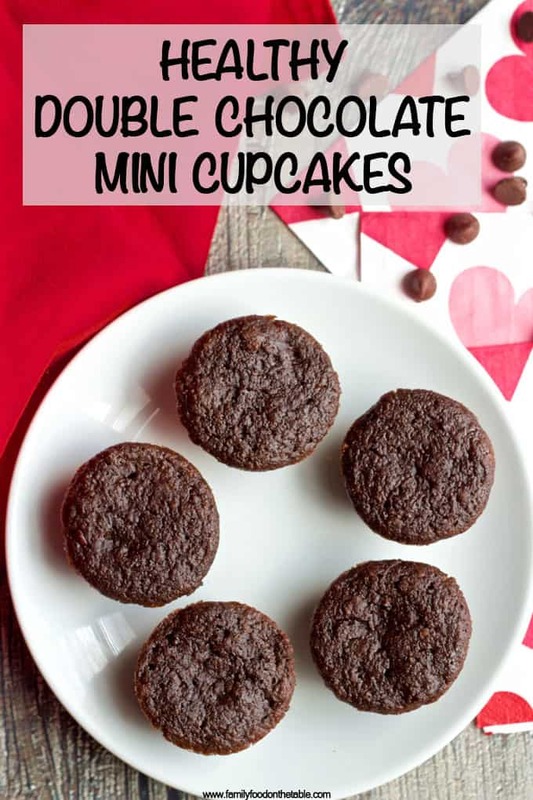 Whether you make these for Valentine’s Day or just to satisfy the must.have.chocolate feeling, I hope you enjoy these super chocolatey mini cupcakes! 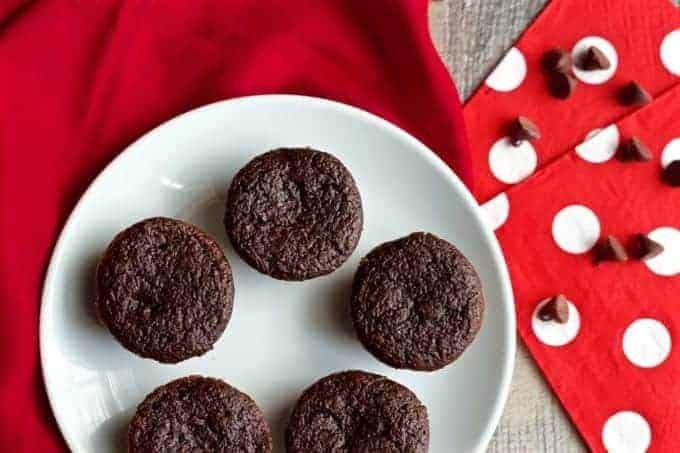 Easy, one-bowl chocolate mini cupcakes are 100% whole wheat, low in sugar and have no butter or oil - and they are super fudgy! Preheat the oven to 350. 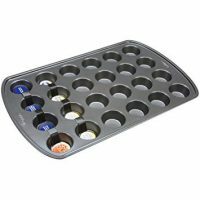 Spray a mini muffin tin pan with cooking spray and set aside. Mix the flour, sugar, cocoa powder, baking powder, baking soda and salt in a large bowl until well combined. Make a well in the center and add the applesauce, milk and vanilla. Stir until just combined. 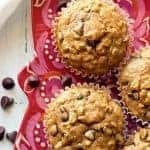 Toss the chocolate chips with the extra flour (this helps keep the from sinking in the batter and sticking to the bottom of the muffin tins). Fold the chocolate chips into the batter. Fill your mini muffin tins. Each muffin cup should be about 3/4 full. Bake at 350 for 14-16 minutes, until done. 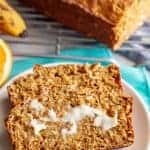 I use white whole wheat flour but you can use whole wheat flour or all-purpose flour if you prefer. 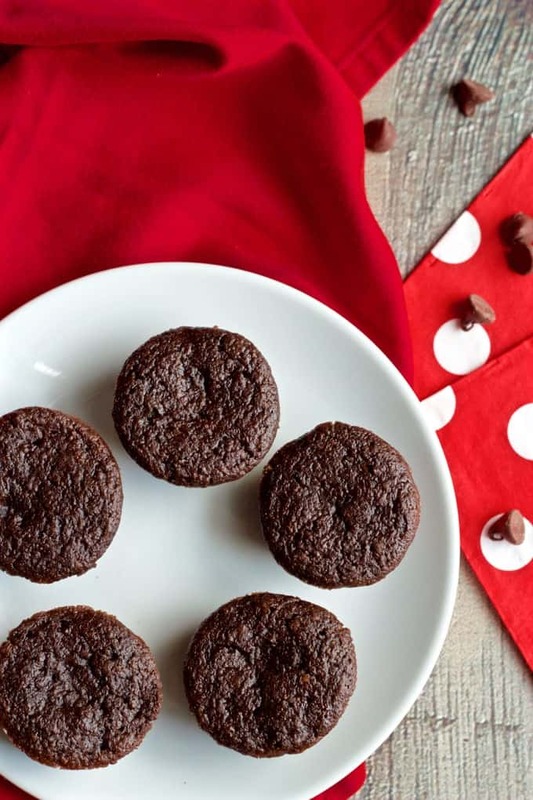 You can make these mini cupcakes vegan by using a milk substitute and vegan chocolate chips. For full-size cupcakes, fill the muffin tins with paper liners and spray with cooking spray. 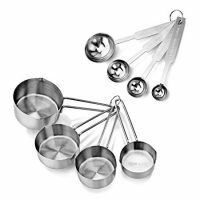 (These don’t have butter or oil so they can stick really easily.) Bake the cupcakes at 350 for 22-24 minutes, until done. Let cool before removing. Makes 10 full-size cupcakes. You can also split the batch and make 6 big cupcakes and 12 mini cupcakes. Obviously my team lost too… sigh. It was not a pretty game that’s for sure. Guess we need to stuff our face with these Mini cupcakes and eat our feelings, huh? 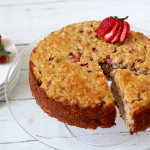 Love that you always put a healthy spin on decadent dishes, Kathryn! 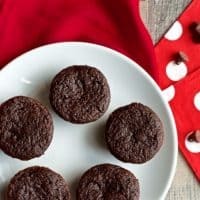 DOUBLE chocolate cupcakes make mini and healthy?!? What’s not to love?? Delicious! Cheers, my dear! This was a crazy Super Bowl for us – I grew up in a bronco-loving family, but my boyfriend and I live in North Carolina now. I figured it was a win/win either way 🙂 Love these chocolately cupcakes – looks like your kiddos love them, too! That’s pretty cool – you win either way with this match-up! These cupcakes look so moist! I’m sold. I like the smaller version too – like a quick one bite snack — I don’t feel guilty at all! 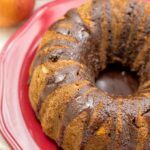 They really are super soft and moist – it’s all the applesauce holding them together! Glad you love a bite-size treat too! These sound so. freakin. good! Almost like brownies in little muffin form. I’ll take a dozen, haha! These little mini cupcakes looks delightful! I love the mini size…kids are still getting a treat, but it’s nice control of portion size! Thanks Jenn! 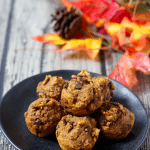 Yes, I like the portion control part of these – for the kiddos and for me! Our team won and won good…no no not trying to rub it in but just saying 😜…just kidding!! 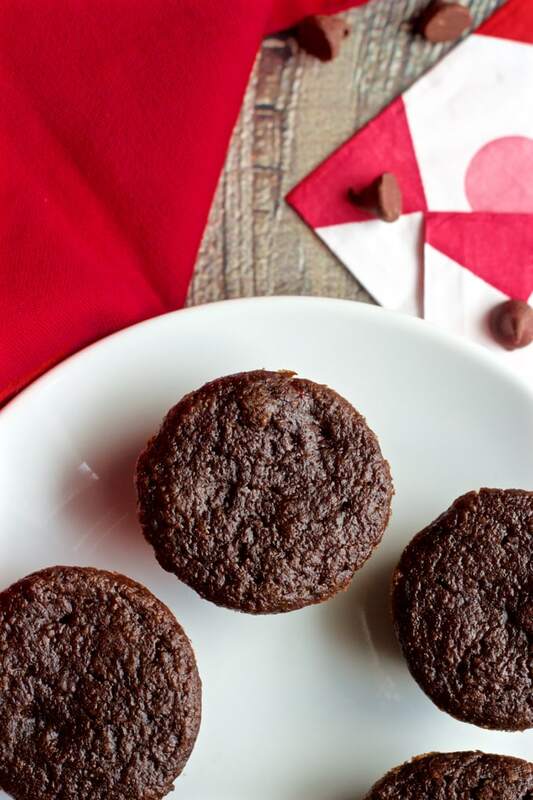 These double chocolate cupcakes are perfect for Valentine and any day! More admiration for you for not giving into the candy demands..
Ohhh you had us at chocolate! Looks so easy and delicious! At least your team was in it! Sorry for the loss, though (my hometown team — Cleveland Browns — is so far removed, and my adopted home team — AZ Cardinals — came really close)! These looks so good! Love the “double chocolate” part — yum! The cupcakes looked great. I like how you ration candy for your kids. Kids these days are too hopped up on sugar anyway. Coming to the recipe, the use of applesauce is genius. I always love it when people use applesauce for baking. Such pretty muffins, my two would love them too. Looks like you made M very happy indeed with these little gems, Kathryn! That’s one happy, chocolately smile right there! These muffins have my name all over them, too. This week has been a serious muffin frenzy in our house! I’ve already made two batches and it’s only Tuesday! So we’ve been having muffins for breakfast, morning tea, afternoon tea and dessert. The best bit? We just don’t get sick of them! These fudgy, chocolately ones will be next on my list of muffiny things to devour 😀 Pinned! 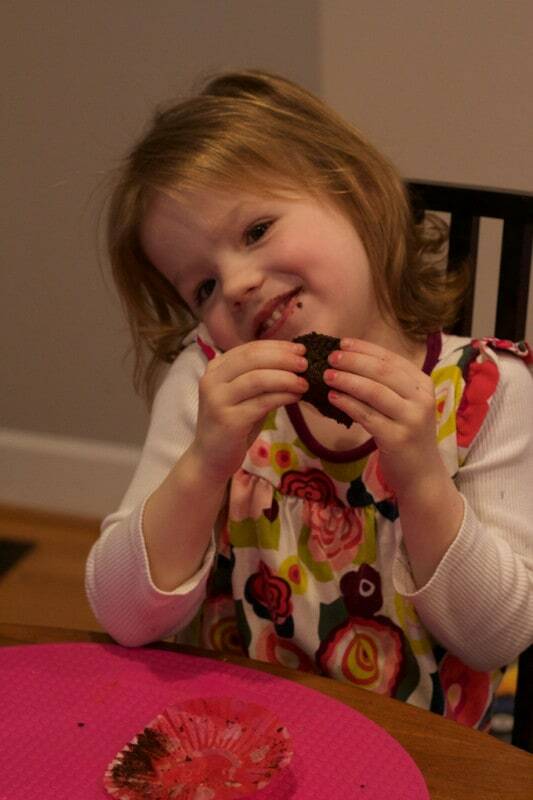 Girl loves her some chocolate! Must get it from me 😉 Hope you love them, too! These would’t be so healthy for me because I just KNOW i’d eat like 10 of them! lol! Thanks for sharing this with us on Throwback Thursday! These are really delicious. 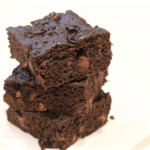 My 2 year old is obsessed with chocolate and so I make these as a healthier option and call it “chocolate cake”. He LOVES them! I’m a healthy baker newbie lol! Ok, can i sub the baking powder to yeast as i used to bake doughnuts with a dry yeast instead of using baking powder? Hi there – so glad you found me! Unfortunately, I don’t think yeast would be a good substitution here. It would likely throw off the chemical mix and mess up the cupcakes. I’d stick with baking powder. Hope that helps!